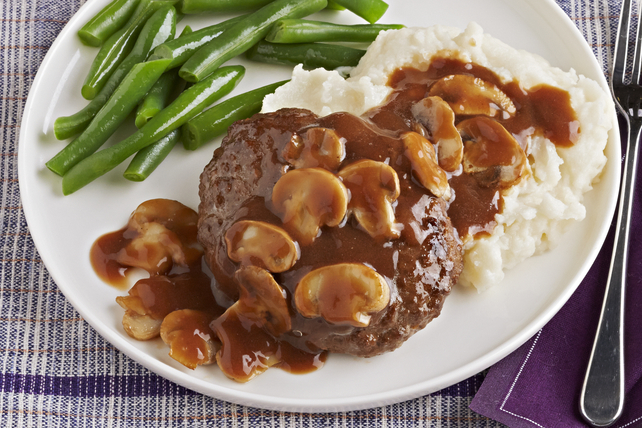 This Garlic-Mushroom Salisbury Steak recipe features moist ground beef patties and a savoury mushroom sauce making this a must-try recipe! Mix meat, bread crumbs, Worcestershire sauce, garlic powder and egg just until blended; shape into 4 (3/4-inch-thick) oval patties. Cook in large nonstick skillet on medium heat 5 to 6 min. on each side or until done (160ºF). Remove burgers from skillet; cover to keep warm. Heat oil in same skillet. Add mushrooms; cook 4 to 5 min. or until evenly browned, stirring frequently. Add gravy; cook 2 to 3 min. or until heated through, stirring frequently. Serve over burgers. Serve with hot mashed potatoes and a steamed green vegetable.